This window depicts saints Peter and Paul standing in front of a canopied structure. St Peter is holding a key. It represents the keys to the kingdom of heaven Jesus Christ gave Peter when he named him as the foundation stone of the church. St Paul’s writings were instrumental in the formation of the early Christian church. He is traditionally depicted holding a sword (as here), the instrument with which he was martyred for the Christian faith. It has been said that this window came from the Aegidius Chapel in Cologne. 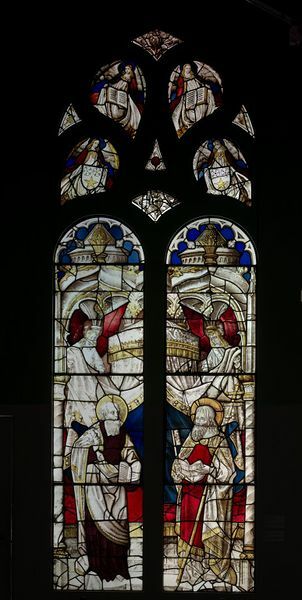 We have no definite evidence for this but the style of the composition and painting of the panels in this window are characteristic of Cologne glass around 1500. The chapel, along with other monastic institutions in the Cologne area, was destroyed or shut down following the Decree of Secularisation issued by France in 1802. The decree was intended to limit the powers of the church and bring it under state control. Much stained glass from these monastic institutions was bought by specialist dealers, such as Christian Geerling. Geerling owned this window, which must have come from a secularised institution, in 1827. Painted glass in two compartments with figures of St. Peter and St. Paul beneath a canopy with angels. Possibly from the Aegidiuskapelle in Cologne. Formerly in the collection of Christian Geerling (died 1848). At one point, this was displayed in Window K, room 143. France's expansionist policies after the French Revolution under Napoleon led to the creation of satellite states on its borders. The former German principalities of the Rhine area were formed into the Confederation of the Rhine. France had issued several decrees intended to limit the powers of the Church and bring it under state control. This led to the issuing of the Decree of Secularisation in 1802. Many monastic institutions in the Confederation of the Rhine and especially in and around the city of Cologne were adversely affected by this decree. The monasteries were shut down and their buildings and furnishings sold off. 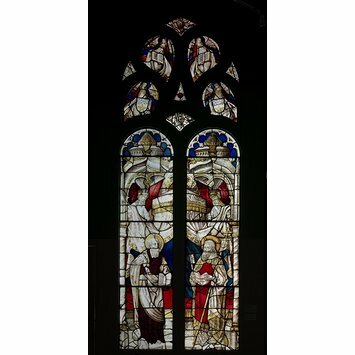 Much stained glass from these monastic institutions was bought by specialist dealers such as Christian Geerling. Geerling owned this window in 1827 which must have come from a secularised institution. It has been said that this panel came from the Aegidius Chapel in Cologne which was destroyed at the time of the secularisation. We have no definite evidence to substantiate this claim but the style of the composition and painting of the panels in this window are characteristic of Cologne glass around 1500. The window depicts Saints Peter and Paul standing in front of a canopied structure. Two angels pull back the drapes of the structure. Jesus Christ had named Peter as the foundation stone of the church and gave him the keys to the kingdom of heaven. St. Peter can be indentified in this window by the keys he is holding. The other figure is St. Paul whose writings were instrumental in the formation of the early Christian church. He is traditionally depicted holding a sword, the instrument by which he suffered martyrdom for the Christian faith.